Integral Options Cafe: Adult Recollections of Childhood Memories: What Details Can Be Recalled? Adult Recollections of Childhood Memories: What Details Can Be Recalled? The validity of recovered memories in prosecuting child molestation and abuse has been an ongoing battle between the legal and the psychotherapeutic communities. Often, the memories that emerge are highly-detailed and specific. In this new study, researchers suggest that full memories do not tend to occur before the age of 6, give or take 6 months. However, they allow for the possibility of highly-charged emotional events possibly making memories more accessable. Obviously a key question here is, are these overly-specific memories accurate? Some studies suggest that they might be. Usher and Neisser (1993) found that adults could recall early memories to the age of 2 and below if those memories were associated with other significant events in the child’s life such as, for example, the birth of a sibling (see Eacott & Crawley, 1998, for similar evidence of adult recall of childhood memories below the age of 3 years). One problem here, however, is that although the date of the associated ‘important’ event can be verified, the memory itself cannot be, leaving open the possibility of error and even that of false memory. There is a problem here, however. The study designs the researchers tend to use here only are capable of observing processes, not experiences. There is no personal or emotional investment in the tests subjects perform, so there is no substantive need to remember (or, crucially, not remember) anything specific. The parts of the brain where memories are stored need to distinguish between significant experiences and those that carry less importance, giving priority to the transformation of the former into long-term memory, the researchers explained. One factor that scientists believe to be critical in that process is the emotional load of an event. Indeed, studies have shown that heightened states of emotion can facilitate learning and memory. In some situations, this process can even become pathological, Malinow said, as occurs in posttraumatic stress disorder (PTSD), a condition characterized by persistent vivid memories of traumatic events. Norepinephrine, more widely known as a "fight or flight" hormone, energizes the process by adding phosphate molecules to a nerve cell receptor called GluR1. The phosphates help guide the receptors to insert themselves adjacent to a synapse. "Now when the brain needs to form a memory, the nerves have plenty of available receptors to quickly adjust the strength of the connection and lock that memory into place," Huganir says. Huganir and his team suspected that GluR1might be a target of norepinephrine since disruptions in this receptor cause spatial memory defects in mice. They tested the idea by either injecting healthy mice with adrenaline or exposing them to fox urine, both of which increase norepinephrine levels in brain. Analyzing brain slices of the mice, the researchers saw increased phosphates on the GluR1 receptors and an increased ability of these receptors to be recruited to synapses. When the researchers put mice in a cage, gave a mild shock, took them out of that cage and put them back in it the next day, mice who had received adrenaline or fox urine tended to "freeze" in fear -- an indicator they associated the cage as the site of a shock -- more frequently, suggestive of enhanced memory. However, in a similar experiment with mice genetically engineered to have a defective GluR1 receptor that phosphates cannot attach to, adrenaline injections had no effect on mouse memory, further evidence of the "priming" effect of the receptor in response to norepinephrine. Children exhibited age-related improvements in memory suppression from age 8 to 12 in both memory tests, against a backdrop of overall improvements in declarative memory over this age range. These findings suggest that memory suppression is an active process that develops during late childhood, likely due to an age-related refinement in the ability to engage PFC to down-regulate activity in areas involved in episodic retrieval. In working with trauma survivors, there tends to be either very vivid and detailed memories of abuse, neglect, or molestation or a sense that something terrible happened with no clear memories. Often, in the later group, there is intense frustration around the inability to remember the abuse, as if remembering will be the key to healing. Granted, this is sometimes the case, but as Babette Rothschild has pointed out (8 Keys to Safe Trauma Recovery: Take-Charge Strategies to Empower Your Healing), remembering is NOT essential to healing. So, as a trauma therapist, I do believe memories can be repressed or suppressed. I believe these memories can surface years later when some life event triggers the emotional context of the memory. I believe there can be early life memories (before the age of 6), although I tend to agree that highly-detailed memories from those early periods are not likely to be accurate. However, when conducting therapy, we act "as if" what the client tells me is true. For the client, in some sense, it is very true. I am not a detective and I will never know for sure what is true and not true in the memories of my clients. That really is not relevant. The question is always: How are those memories impacting your life right now? How is your childhood not in the past but still in the present? In what ways are there ghosts from years past still haunting you in some way? These are some of the important questions. In a memory survey adult respondents recalled, dated, and described two earliest positive and negative memories that they were highly confident were memories. They then answered a series of questions that focused on memory details such as, clothing, duration, weather, etc. Few differences were found between positive and negative memories that on average had 4/5 details and dated to the age of 6/6.5 years. Memory for details about activity, location, and who was present was good, memory for all other details was poorer or at floor. Taken together these findings indicate that (full) earliest memories may be considerably later than previously thought and that they rarely contain the sort of specific details targeted by professional investigators. The resulting normative profile of memory details reported here can be used to evaluate overly-specific childhood autobiographical memories and to identify memory details with a low probability of recall. Accepted Author Version. Not yet edited or proofed. Please see disclaimer on the article abstract page. Relatively little is known about what details, in particular what specific details, adults can recall of early childhood events that they claim to remember, and remember often with great confidence. Since Freud (1915) first introduced the term ‘infantile’ or ‘childhood’ amnesia, based on the results of one of the first surveys of autobiographical memories (Henri & Henri, 1898), there have been many investigations of adult recollections of earliest memories (if not of their details) and often of the first memory (Bruce, Robinson, et al., 2005; Hayne, 2004; Pillemer, 1998; Pillemer & White, 1989; Rubin, 2000; Wang, Conway, & Hou, 2004 – see Bauer, 2007, Howe, 2011, and Strange & Hayne, 2013, for recent reviews). In a meta-analysis Rubin (2000) found the mean age of the earliest memory to date to the age of 3.4 years. Of course there is a distribution around this mean with some remembering earlier memories and many, later memories. It is considered not possible to remember memories from below about the age of 2 years, i.e. from the preverbal period (Hayne, 2004). Typically these very early childhood memories are fragmentary, disorganized, and often enigmatic in the sense that the rememberer does not know why (or how) they remember them. Also these childhood memories can be accompanied by feelings of uncertainty/doubt that they are in fact memories and, occasionally there are aspects of the content of the memories – memory details – or other external evidence that clearly show them to be false (Mazzoni, Scoboria, & Harvey 2010). Even in the later case, however, the memories are experienced as memories, i.e. they are accompanied by recollective experience. “I was in a room, in my cot which was by a window (high up), it must have been sunny because my cot was light but outside the room, through an open door opposite my cot, looked dark. I was playing with a toy in my cot - which was fixed to the side of it, it had a tortoise and a hare on the bottom of it and a telephone dialler, I don't remember seeing it since. I heard a noise and turned round towards the door and tried to stand up but I think I must have been too young to stand. I remember trying to pull myself up with the railings on the cot and I could see my Mum, through the open door, out in the corridor. She appeared from the right and walked directly across the corridor and disappeared into a room and then came out and walked back to the right and disappeared again. I remember wanting to get her attention and wanted to talk but I don't think I could talk - I remember feeling really upset that I couldn't get her to notice me, I was frustrated and felt lonely because I had wanted her to see me. I have talked to my Mum once about it and she said it was at our old house and the stairs had been to the right and the bedroom was directly opposite, which is obviously where she went to and from. I have only told two other people of it since.” (Age about 18 months). Obviously a key question here is, are these overly-specific memories accurate? Some studies suggest that they might be. Usher and Neisser (1993) found that adults could recall early memories to the age of 2 and below if those memories were associated with other significant events in the child’s life such as, for example, the birth of a sibling (see Eacott & Crawley, 1998, for similar evidence of adult recall of childhood memories below the age of 3 years). One problem here, however, is that although the date of the associated ‘important’ event can be verified, the memory itself cannot be, leaving open the possibility of error and even that of false memory. Given the near-impossibility of verifying adult recall of very early events one way to approach this problem is to examine what young children themselves can remember. The logic being that if children themselves cannot recall specific details and also have, at least the occasional, overly-specific memory then it seems highly unlikely that decades later, in adulthood, they would have such memories. Thus, Gross, Jack, Davis, & Hayne (in press) investigated the ability of 2 to 5-year old children to recall the recent birth of a younger sibling and compared this to adult recall of the birth of a sibling at about the same age. The central finding was that few children and adults were able to recall the birth of a sibling if that had occurred when they were aged 2. As their age at the time of the birth increased they were gradually able to recall at least some details, but not overly-specific memories. Overall the findings suggest that these events were not encoded into long-term memory in the first place. If so it would not be possible to recall them in adulthood. In addition, further findings indicate that the adults had added in details to their memories. Possibly this may have been from accurate sources, i.e. conversation with the mother, family records, photographs, and so forth. Or, of course, these details may have been inferred and added in over a period of years becoming integral, if false, details of the memory. 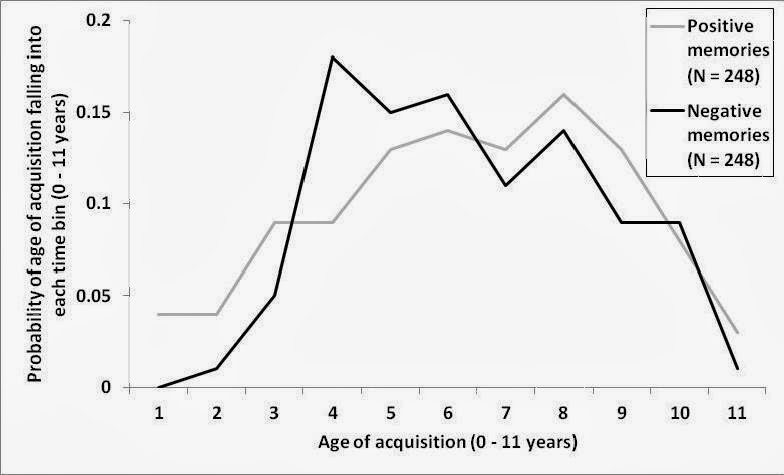 In general the recall of events by children below about the age of five years is substantially different from adult recall of autobiographical memories (indeed it may not be until beyond the 10 to 15 years of age that a memory system approximating that of the adult autobiographical memory system begins to emerge, Conway, 2005, Van Abbema & Bauer, 2005, with yet further changes in latter adolescence and early adulthood, Bluck & Habermas, 2000). The memories of 5-year older children and younger tend to be much less detailed, it is difficult to elicit memory details from them, and the details they do recall are related to their interests and goals which rarely correspond to the interests and goals of adults (comprehensive reviews are available in Bauer, 2007, Howe, 2011). In a recent interesting study of child recall of details of an event Strange and Hayne (2013) had 5- to 6-year olds and 9- to 10-years take part in a surprise school visit to a local fire station. Later they were asked for a free recall of the event and then answered a series of questions about specific details such as the weather, time of day, duration, clothes worn by self and others, their emotions, how others felt, etc. In their free recall virtually none of the children, regardless of age, spontaneously recalled any of the specific details featured in the questions. In response to the questions the older children recalled more about time of day, duration, and own clothes. Generally younger children although showing some improvement on the questions, which obviously contain very specific memory cues, showed impoverished memory for the event. All the children were poor, the younger children at floor, in recalling the date of the event (see too Orbach & Lamb, 2007). These findings suggest that adult recall of childhood events that feature such specific details - overly-specific memories – should be treated with considerable caution.